Forty years ago, Buzz Aldrin became the second human, minutes after Neil Armstrong, to set foot on a celestial body other than the Earth. The event remains one of mankind's greatest achievements and was witnessed by the largest worldwide television audience in history. In the years since, millions more have had their Earth-centric perspective unalterably changed by the iconic photograph of Aldrin standing on the surface of the moon, the blackness of space behind him and his fellow explorer and the Eagle reflected in his visor. Describing the alien world he was walking upon, he uttered the words "magnificent desolation." And as the astronauts later sat in the Eagle, waiting to begin their journey back home, knowing that they were doomed unless every system and part on board worked flawlessly, it was Aldrin who responded to Mission Control's clearance to take off with the quip, "Roger. Understand. We're number one on the runway." The flight of Apollo 11 made Aldrin one of the most famous persons on our planet, yet few people know the rest of this true American hero's story. 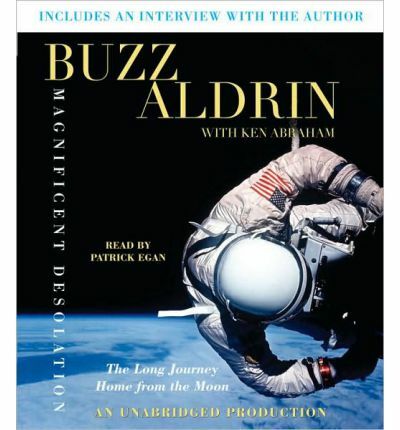 In "Magnificent Desolation," Aldrin not only gives us a harrowing first-person account of the lunar landing that came within seconds of failure and the ultimate insider's view of life as one of the superstars of America's space program, he also opens up with remarkable candor about his more personal trials-and eventual triumphs-back on Earth. From the glory of being part of the mission that fulfilled President Kennedy's challenge to reach the moon before the decade was out, Aldrin returned home to an Air Force career stripped of purpose or direction, other than as a public relations tool that NASA put to relentless use in a seemingly nonstop world tour. The twin demons of depression and alcoholism emerged-the first of which Aldrin confronted early and publicly, and the second of which he met with denial until it nearly killed him. He burned through two marriages, his Air Force career came to an inglorious end, and he found himself selling cars for a living when he wasn't drunkenly wrecking them. Redemption came when he finally embraced sobriety, gained the love of a woman, Lois, who would become the great joy of his life, and dedicated himself to being a tireless advocate for the future of space exploration-not only as a scientific endeavor but also as a thriving commercial enterprise. These days Buzz Aldrin is enjoying life with an enthusiasm that reminds us how far it is possible for a person to travel, literally and figuratively. As an adventure story, a searing memoir of self-destruction and self-renewal, and as a visionary rallying cry to once again set our course for Mars and beyond, "Magnificent Desolation" is the thoroughly human story of a genuine hero. "From the Hardcover edition." About the Author: On July 20, 1969, Apollo 11 astronauts Buzz Aldrin and Neil Armstrong landed their lunar module on the moon's Sea of Tranquility and became the first two humans to walk on the moon. This unprecedented heroic endeavor was witnessed by the largest worldwide television audience in history. He was presented the Presidential Medal of Freedom, the highest honor among over 50 other distinguished awards and medals from the United States and numerous other countries. Since retiring from NASA, the Air Force, and his position as commander of the Test Pilot School at Edwards Air Force Base, Dr. Aldrin has remained at the forefront of efforts to ensure a continued leading role for America in manned space exploration. To advance his lifelong commitment to venturing outward in space, he founded his rocket design company, Starcraft Boosters, Inc., and the ShareSpace Foundation, a nonprofit organization devoted to opening the doors to space tourism for all people. Buzz and his wife, Lois, live in Los Angeles. Ken Abraham is a New York Times bestselling author, known around the world for his collaborations with celebrities and high-profile public figures.